We depend on donations and fundraising events to fund our service. We are very grateful to the individuals, families, companies and organisations who are helping us continue to support children and young people affected by loss and bereavement. Every penny makes a difference and no matter how large or small the amount, please be assured that it will be used to support children and young people living locally. You can also support us when you shop with Amazon. To do this you must log in through smile.amazon.co.uk and select Sunrise Partnership as your charity. 0.5% of the net purchase price will be donated to us by Amazon. You can download the AmazonSmile app to make it even easier. Whether you are looking to make a regular or a one-off donation, please click the ''Donate Now' button below. Thank you for your support. A donation from CALA Homes was used to buy puppets which can be helpful in encouraging children to talk about how they are feeling. 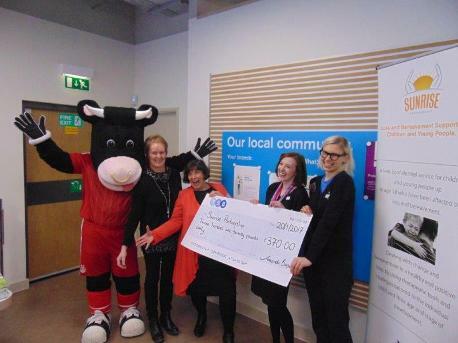 All fun and smiles with our friends at TSB St Nicholas.